Women have served in the United States House of Representatives since the 1917 entrance of Jeannette Rankin from Montana, a member of the Republican Party. Over 300 women have since served as U.S. Representatives. 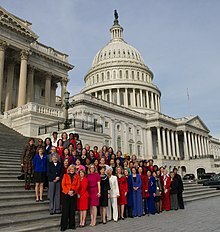 As of January 2019, there are 102 women in the U.S. House of Representatives (not counting four female territorial delegates), making women 23.4% of the total of U.S. Representatives. Women have been elected to the U.S. House of Representatives from 46 of the 50 states. The states that have not elected a woman to the U.S. House of Representatives are Alaska, Mississippi, North Dakota and Vermont—though Alaska, Mississippi and North Dakota have elected women to the United States Senate. Women have also been sent to congress from 5 of the 6 territories of the United States; the only Territory that has not sent a woman to the U.S. House of Representatives is the Northern Mariana Islands. California has elected more women to Congress than any other state, with 41 U.S. Representatives elected since 1923. To date, no woman has ever been elected from more than one state at different times, switched parties, or served as a third-party member in her career (though one was elected as an Independent). Sometimes called the "Lady of the House", Jeannette Rankin entered the U.S. House of Representatives in 1917 as the first woman in Congress. Nancy Pelosi, 52nd Speaker of the United States House of Representatives (2007–2011, 2019–), the only woman to hold the position. Jeannette Rankin entered the U.S. House of Representatives in 1917 as the first woman in either chamber of Congress. Florence Prag Kahn entered the U.S. House of Representatives in 1925 as the first Jewish woman in either chamber of Congress. U.S. Representative Vera Buchanan died in 1955, making her the first woman in either chamber to die in office. Patsy Mink, an Asian American, entered the U.S. House of Representatives in 1965 as the first woman of color in either chamber of Congress. U.S. Representative Charlotte Reid became the first woman to wear pants in the U.S. House of Representatives or U.S. Senate in 1969. Shirley Chisholm entered the U.S. House of Representatives in 1969 as the first African-American woman in either chamber of Congress. In 1973, U.S. Representative Yvonne Brathwaite Burke became the first member of the U.S. House of Representatives or U.S. Senate to give birth while in office, and first person to be granted maternity leave by the Speaker of the U.S. House of Representatives, with the birth of her daughter Autumn. The gym of the U.S. House of Representatives (with the exception of its swimming pool) first opened to women in 1985, the gym having previously been male-only. The swimming pool opened to women in 2009, the pool having previously been male-only. Ileana Ros-Lehtinen entered the U.S. House of Representatives in 1989 as the first Latina in either chamber of Congress. Tammy Baldwin entered the U.S. House of Representatives in 1999 as the first openly gay woman in either chamber of Congress. Nancy Pelosi became the first female House Minority Whip in 2002. She went on to become the first and only to date female Speaker of the United States House of Representatives in 2007. Also in 2007, Mazie Hirono entered the U.S. House of Representatives as the first female Buddhist in either chamber of Congress. In 2011, the U.S. House of Representatives got its first women’s bathroom near the chamber (Room H-211 of the U.S. Capitol). Tulsi Gabbard entered the U.S. House of Representatives in 2013 as the first Hindu person in either chamber of Congress. Also in 2013, Kyrsten Sinema entered the U.S. House of Representatives as the first openly bisexual woman in either chamber of Congress. In the 2018 general elections, there was a wave of firsts elected to the United States House of Representatives for the 116th Congress. A record-breaking 103 women have been elected or re-elected into the United States House of Representatives, causing many to call it the "Year of the Woman". Ilhan Omar and Rashida Tlaib became the first Muslim women ever elected to either house of Congress, with Tlaib the first Palestinian-American woman elected to Congress and Omar the first Somali American of either gender to be elected. Also in this election, Angie Craig became the first lesbian mother to be elected to Congress. Sharice Davids and Deb Haaland became the first Native American women elected to the U.S. House of Representatives. Alexandria Ocasio-Cortez became the youngest woman to be elected into either house of Congress. Mae Ella Nolan was the first woman elected to her husband's seat in Congress, which is sometimes known as the widow's succession. In the early years of women in Congress, the seat was held only until the next election and the women retired after that single Congress. She thereby became a placeholder merely finishing out her late husband's elected term. As the years progressed, however, more and more of these widow successors sought re-election. These women began to win their own elections. 38 widows have won their husbands' seats in the House, and eight in the Senate. The only current example is Representative Doris Matsui of California. The most successful example is Margaret Chase Smith of Maine, who served a total of 32 years in both houses and became the first woman elected to both the House and the Senate. She began the end of McCarthyism with a famous speech, "The Declaration of Conscience", became the first major-party female presidential candidate and the first woman to receive votes at a national nominating convention, and was the first (and highest ranking to date) woman to enter the Republican Party Senate leadership (in the third-highest post of Chairwoman of the Senate Republican Conference). The third woman elected to Congress, Winnifred Huck, was similarly elected to her father's seat. This is a complete list of women who have served as U.S. Representatives or delegates of the United States House of Representatives, ordered by seniority. Members are grouped by the apportionment period during which such member commenced serving. This list includes women who served in the past and who continue to serve in the present. Daughter of James M. Gudger Jr. There have been ten female members of the House of Representatives who were pregnant and gave birth at least once during their tenure (one member three times). Yvonne Brathwaite Burke California Democratic November 23, 1973 41 The daughter, Autumn Burke, became notable in her own right. Susan Molinari New York Republican May 10, 1996 38 The child's father was fellow congressman Bill Paxon. Blanche Lincoln Arkansas Democratic June 1996 35 Chose not to run for re-election due to the pregnancy. Gave birth to twin boys. Stephanie Herseth Sandlin South Dakota Democratic December 15, 2008 38 The child's father was former congressman Max Sandlin. ^ "RANKIN, Jeannette - US House of Representatives: History, Art & Archives". history.house.gov. ^ "Florence Prag Kahn". www.jewishvirtuallibrary.org. ^ Mariotti, Renato (November 26, 2013). "Rep. Vera Buchanan dies in office, Nov. 26, 1955". Politico. Retrieved April 12, 2018. ^ "August House Publishers - Atlanta - Children's Book Publisher". August House Publishers - Atlanta - Children's Book Publisher. ^ "New Patterns - US House of Representatives: History, Art & Archives". ^ "Update: First woman to wear pants on House floor, Rep. Charlotte Reid". Washington Post. ^ "CHISHOLM, Shirley Anita - US House of Representatives: History, Art & Archives". history.house.gov. ^ "BURKE, Yvonne Brathwaite | US House of Representatives: History, Art & Archives". history.house.gov. Retrieved May 4, 2016. ^ Michelle Cottle, ed. (April 19, 2018). "Congress Can't Give Up Tradition". The Atlantic. Retrieved April 27, 2018. ^ Press, The Associated. "Tommy vs. Tammy rages on: Senate race down to the wire". ^ "Tammy Baldwin - Candidate for U.S. President, Republican Nomination - Election 2012". WSJ.com. ^ Jon M. Shepard (January 1, 2012). Cengage Advantage Books: Sociology. Cengage Learning. pp. 293–. ISBN 978-1-133-71002-8. ^ Blumberg, Antonia (March 7, 2018). "Nancy Pelosi Donates Historic Speaker's Gavel To The Smithsonian For Women's History Month". Huffington Post – via Huff Post. ^ "Women in U.S. House get new restroom near chamber". USA Today. July 21, 2011. ^ "Hindu-American Tulsi Gabbard wins Democratic primary in Hawaii". The Economic Times. August 12, 2012. ^ Stephen Prothero (January 3, 2013). "Column: A Hindu moment for Congress". Usatoday.com. Retrieved April 27, 2018. ^ Edmondson, Catie; Lee, Jasmine C. (November 28, 2018). "Meet the New Freshmen in Congress". The New York Times. ISSN 0362-4331. Retrieved January 11, 2019. ^ The 2018 Midterms, In 4 Charts. FiveThirtyEight. By Rachael Dottle, Ella Koeze and Julia Wolfe. Nov. 13, 2018. ^ Women candidates for Congress 1974 - 2018. Center for American Women and Politics. There are separate columns for House and Senate numbers by election. Party and seat summary for major party nominees. ^ "Women in the United States Congress: 1917-2011" (PDF). ^ "The U.S. Made Zero Progress in Adding Women to Congress". ^ Parker, Ashley (April 12, 2018). "First Day of 113th Congress Brings More Women to Capitol" – via NYTimes.com. ^ Akers, Mary Ann (November 20, 2008). "Rep. Linda Sanchez Expecting a Baby". Washington Post. ^ Foster, David (November 19, 1995). "Ambitious Couple Thrived on Passion for Politics, Each Other : Congress: Enid Greene and Joe Waldholtz seemed born for each other. But his lies over money sabotaged fairy tale, perhaps her career". Los Angeles Times. Associated Press. ^ Geranios, Nicholas K. (April 21, 2007). "Baby in the House: Pregnant congresswoman due to give birth next month". San Diego Union Tribune. Associated Press. ^ "It's A Boy". Spokesman Review. April 30, 2007. ^ "Son Born to New York Congresswoman". New York Times. Associated Press. May 16, 2008. ^ Woster, Kevin (December 16, 2008). "Something we can all agree on: Congratulations!". Rapid City Journal. ^ Akers, Mary Ann (May 13, 2009). "New Mama in the House: Linda Sanchez". Washington Post. ^ "Republican Rep. Jaime Herrera Beutler celebrates 'miracle' baby girl born with Potter's sequence". New York Daily News. July 29, 2013. ^ Korte, Gregory (November 25, 2013). "Rep sets congressional record -- mom x 3". USA Today. Retrieved November 23, 2014. ^ Skiba, Katherine (November 20, 2014). "Rep. Tammy Duckworth gives birth to daughter". Chicago Tribune. ^ Dake, Lauren (May 19, 2016). "Herrera Beutler gives birth to baby boy". The Columbian. Retrieved December 28, 2018. Maurer, Elizabeth. "Legislating History: 100 Years of Women in Congress". National Women's History Museum. 2017.